Photo courtesy of boo_licious via Flickr. I’m not a big sports fan, but I can appreciate an event like the Super Bowl. Any event that brings people together and involves food can’t be all bad. The big event is just a couple of days away. Here’s a few quick dishes that you can whip up if you still haven’t figured out what you’re going to feed the crowd. 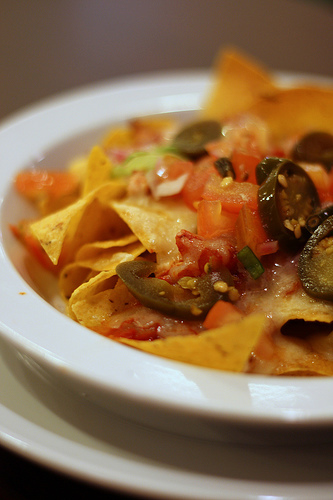 Nachos – Heat a jar of picante sauce, a can of nacho cheese soup and some chopped jalapeno peppers on the stove. Stir often. Serve with chips. Sliders – Mix a package of ground beef with two cap fulls of Mrs. Dash seasoning (or the store-brand equivalent, which is cheaper and tastes the same). Form into small patties. Grill in a medium pan. Top with slices of pepperjack cheese, and serve on King’s Hawaiian Rolls. Potato wedges – Bake a bag of frozen potato wedges according to package instructions. Right after you take them out of the oven, sprinkle with salt, pepper and paprika. Serve with ketchup spiked with Frank’s Hot Sauce. Pizza – Top pita bread with pasta sauce, spinach and mozzarella cheese. Bake for 10-15 minutes or until cheese is melted. Personally, it’s not a party unless there is some Guacamole!!!!!!!!!!!!!!!! !